One Monday morning, a few months following my 1st Bowen class, a patient presented with a lump the size of an almond beneath the arch on the right foot. She told me that there was no pain involved however, she was favoring it and this was causing pains in her hip and lower back. She was also concerned due to the fact that we are all suspicious when a “lump” appears. I reassured her that the lump was a classical benign plantar fibroma. Only if it grew rapidly or became painful should she consider having it removed. I informed her about the therapy that I had recently discovered and she immediately took me up on my offer. When we were all finished she arose from the table and said, “Oh my, I feel so good”. “Can I come back tomorrow for another treatment?” I told her that we should wait one week before another session and for her to make an appointment. When she returned the following week the lump had reduced to the size of a pea and she said that she couldn’t wait for another Bowen treatment. She scheduled another check on her foot and Bowen session one week later. I began the therapy prior to looking at her foot. During a point where the muscles are released on the inner thigh area (Amterior Pelvis Procedure) she asked, “Is there any connection between that lump on my foot and my stomach?” I said, I don’t think so. Why?” She replied, “On the first visit when you released those muscles in the inner part of my thigh and left the room for me to rest, I immediately felt like a gush of worms crawling around in my stomach. All day long I had a queasy feeling in my stomach. And, when I got home from work that night my stomach and gallbladder pain completely disappeared. I have not had to take any of my stomach medications for the past 3 weeks. And, I flushed $200 worth of prescriptions down the toilet this morning. When I get to work I am calling the gastroenterologist who has been taking care of me the past 2 years and canceling my appointment for next month. I won’t need him any more”. I begged her not to mention my connection with any of this, as I do not want to be in any trouble with the medical community. She assured me that she would not and, she said, “Look at my foot”. As I looked for the lump it was almost completely gone. It was about the size of a grain of rice! I found an old foot reflexology book and opened to the foot chart. Sure enough, the lump was right in the middle of the stomach and liver zone. I told her about that and she laughed, left the office quite happily, and has never returned. Two years later I was studying Acupuncture and recalled the incident. 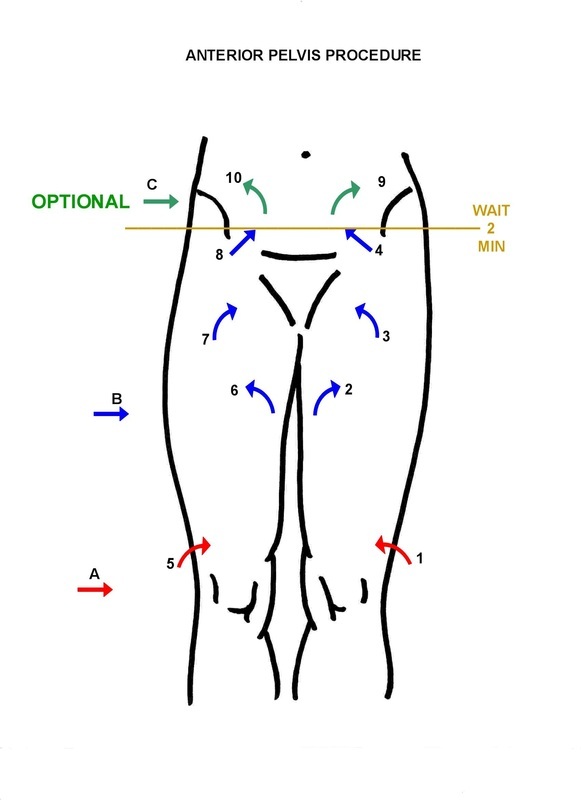 When I looked at the meridian chart I saw that 2 of the 4 meridians that pass through the inner thigh and groin are the stomach and liver meridians. I could chalk it all up to coincidence or spontaneous remission. Or, I could believe that there was some kind of obstruction in that muscle tissue which was blocking the flow of energy. When the blockage was released she then felt the “Gush of worms into her stomach”. Then, she healed herself. I tend to believe in the later. What is most perplexing is that the pathology reports following biopsy of these fibrous lesions in the plantar foot area always state, “Benign fibroplasia. Multiple fibroblasts and swirls of collagen”. I’m not sure as to how this tissue could recede in 3 weeks. But, it did. Procedures performed during her sessions included low back, mid back, upper back, neck, hamstrings, respiratories, kidney, knee, ankle, pelvis, and tmj.